Are you a lonely male skeptic? Is science your religion? Do you sneer at anyone who believes, for example, that a few UFO cases might be something truly mysterious, extraordinary? And, more importantly, are you a cynical alcoholic on the way to the gutter? Well, I have a blog for you: http://skepchick.org/blog . I’ve never read this blog in great depth but from time to time I’ve checked out some of the posts. When it comes to the paranormal, I try to look at the subject from all sides. As with any field of interest, sometimes you have to deal with the personalities involved to extract some data, overlooking the opinion mixed in with the fact. 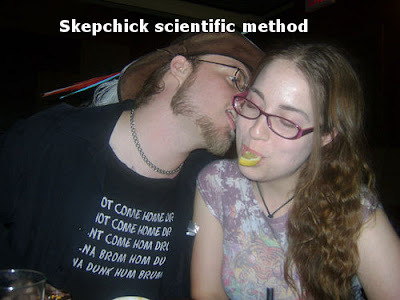 The head skepchick, Rebecca, likes to blab on about “drinkathons” in Boston, Philadelphia, and New York City where fellow skeptics gather to put down various outlier beliefs while putting down lotsa booze. In a post entitled “Brilliant Idea: The 10-Minute Lecture” (11/20/08), Rebecca mentions that at one such meet-up that one scientist “suggested that this sort of event would be a great way to connect with a more general audience.” The she adds: “…at least, I think that’s what he said, I was well into my second giant beer at that point.” Just like driving a car, skeptical thinking works better with an alcohol level that blows up a Breathalyizer. In another post, fellow skepchick Elyse writes about the “Skepchick Drink Contest Results, The Reckoning” (11/21/08). A number of concoctions were sampled, including the Buzzed Aldrin and the Sylivia Browne. After printing the letter, Rebecca decided to check out Sean’s website to “mock it mercilessly.” In her response Rebecca admits that she’s engaging in an ad hominem attack but that’s OK: some paranormal claims are so ridiculous that they deserved ridicule. Ridicule. That’s part of the scientific method? She lambastes Sean for using the spirit image of a Native American (you know, an Indian) on his home page because he’s supposed to be an Irish psychic. No prejudice there, huh? In general I don’t believe in psychics, but I do know that they claim to channel beings from beyond time and space, i.e., they’re not limited to the geographically specific location where they live. Of course, Sean did leave himself open to snark, probably because didn’t do his research and checked out the Skepchicks blog in any great detail. At the same time, he didn’t attack Rebecca. If Rebecca was half the man she claims to be as a skeptic, trying to spread (her version of) the truth, she could’ve taken the high road and politely pointed out why she doesn’t agree with Sean’s beliefs. But why would Rebecca and some of her other skeptics be so concerned about acting like considerate adults? Here’s a sobering thought: Treat others as you would want to be treated. That’s an ideal that most people would raise a glass to.